Home sales in Nashville and Davidson County heated up in May as sales prices continue to climb. The total number of units sold in May were up 4% and average home sales prices were up 9% from last year. There were 1,773 home sales recorded for the month averaging $318,430 compared to 1,708 sales recorded in May 2016 averaging $292,767. Median home sale prices were up 9% from last year to $261,000 versus $238,900 last May. Through the first five months of 2017 the number of home sales recorded are up 3% and the average home sales price is up 9% from the same period of 2016. Antioch (37013) had the most home sales for the month with 167 recorded averaging $191,058. Belle Meade/West End (37205) recorded the highest average sales price for the month of $681,526 across 89 sales. May home sales were up 2% with 652 sales recorded for the month compared to 641 recorded in May 2016. The average home sales price was up 15% to $524,903. The median sales price was $450,562, up 10% from last year. Franklin West (37064) had the most home sales for the month with 184 sales recorded averaging $513,325. College Grove (37046) had the highest average sales price of $889,647 across 11 sales. There are a lot of Robert Anderson designed homes on the market right now, and this special home in Franklin is ready for its new owner! Lush landscaping and mature trees frame this brick home with a sophisticated, stylish interior. Contact me for details. For those interested in the artisan maker scene – this is the weekend for you! Both the Porter Flea Summer Market and the American Artisan Festival are being held, so this is your chance to get a jump on holiday shopping, or treat yourself to something unique. 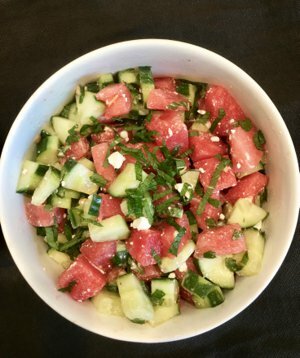 When the heat soars, and watermelon and cucumbers are plentiful, I make this salad that fills you up, cools you off and even quenches your thirst.